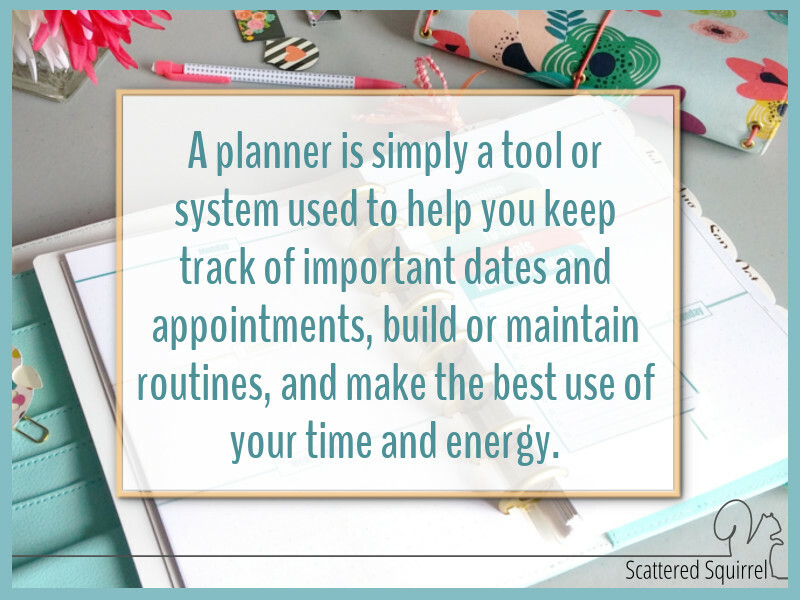 I firmly believe that a planner is one of the most valuable tools anyone can use. Whether you are already organized or just starting your journey to a more organized life; whether you have a wonderful handle on your time management skills or are like me, still struggling to build the right routines; a good planner can go a long way to helping you achieve or maintain some control over your world. After yesterday’s interview, I started mulling things over. There were so many things I wanted to say that I couldn’t due to time constraints, and I realized that this post couldn’t be just a single post. To give it the proper attention it really deserves and to make sure that I don’t gloss over things that might be important to you it needed to grow, and grow it has – into a whole series. I want to help each and every one of you out there create the planner that works for YOU, and that is what I am hoping to do with this series that I’m calling: Creating the Planner that Works for You! So, what is a planner? I know some of you are looking at your screens in concern, considering how much I love planners and all the planner pages I’ve shared, you would think I would already know the answer to that question. And I do. 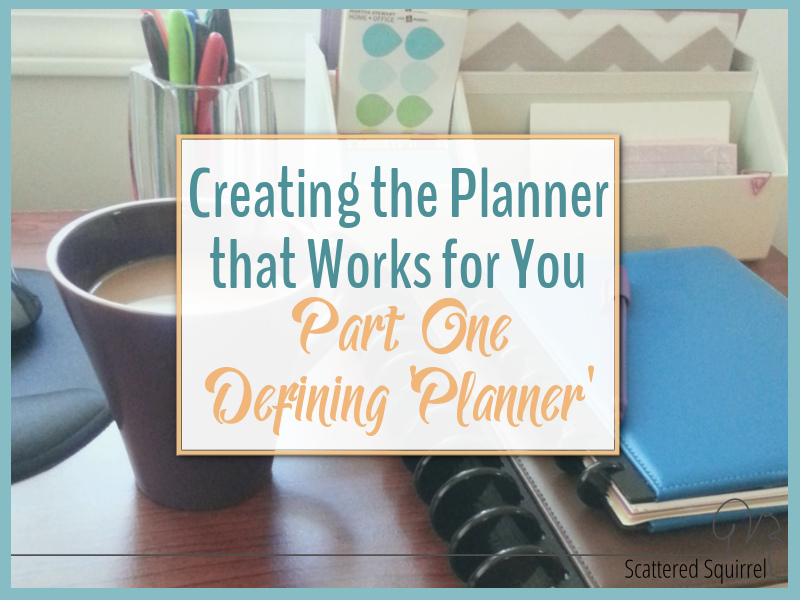 I know what a planner is for me, but what is it for you? Before you can start creating the planner that works for you, you need to take some time to think about what a planner looks like for you. Don’t worry, I’ll walk you through it. If you type the word planner into Google, you will get a ton of results. Click on the Image tab, and you’ll be scrolling through pictures of coil bound day planners, Filofax and more. When someone says planner, these are generally the things that spring to mind. Which is fine. It is, after all, what they are, but the truth is, planners like these do not work for everyone and nor should they. But then, how do I help you create a planner that works for you when the conventional planners don’t work? Well, it’s time to change our definition of the term planner. According to the web definition on Google, a planner is a list or chart with information that is an aid to planning. To a certain extent, I agree, but I think it needs a little tweaking. I really do mean that. A planner is as simple as that. Once you allow yourself to start thinking outside the ring binding, you open yourself up to the ideas and concepts that might just work for you. Creating a planner that works for you is a lot of trial and error. For some, they may already know exactly what they want, and it might only need a few tweaks. For others, myself included, creating the right planner is almost as much of a journey as the journey to organized living itself. 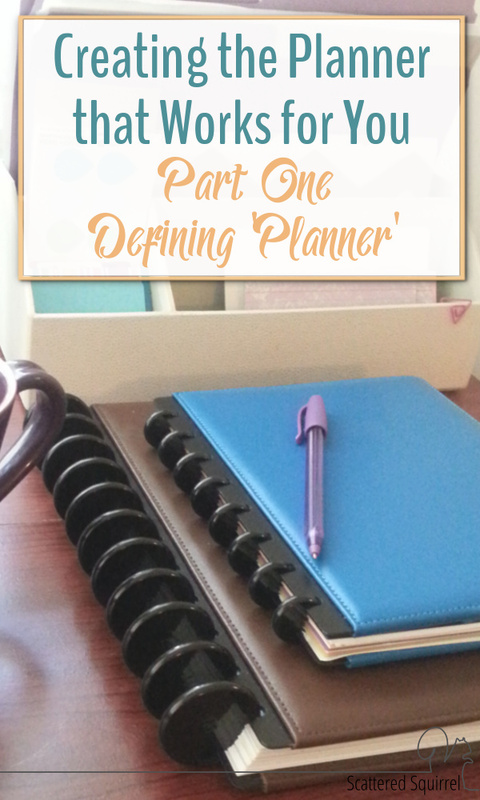 So how do you decide what planner is right for you? You start by figuring out what didn’t work! Take a few minutes to think about what hasn’t worked for you in past, and jot those things down. Do you have a calendar on your wall but nothing is written on it, or maybe it’s still in June because you’ve forgotten about it completely? Do you write to-do lists on scrap paper and then misplace them? Do you have a dated day planner that is gathering dust because you bought back in January bound and determined to be more organized, only to find it too fiddly or too confining, or just not right for you? Maybe you have one of the Mommy Planners with all the pages you need to keep your family organized, but you only use the weekly planner sheets with consistency? When it comes to getting organized, whether we’re talking about our houses or our time, it is really easy to take a look at the newest thing or the most popular planner and think “If I have this I will be organized” but it doesn’t work that way. The best way to find what works for us is to start by examining what hasn’t worked in the past. You’ve tried it already. It didn’t work. Let’s not repeat that step. Let’s learn from it and move forward. Think about why things you’ve tried haven’t worked and jot those reasons down. If there was a part you really liked, jot that down too! When you’re done thinking about what hasn’t worked, take a little time to think about things you’ve tried that you liked or that worked for you in some way. Maybe you use the monthly pages in that day planner? Maybe you use that wall calendar your insurance company sends you every year? Think about what things you use or do that help you keep track of what’s going on in your world. Jot those down, they’re important to helping you move forward. We’ve opened the door to ideas outside of the conventional planner; taken a good long look at systems and tools we’ve tried but didn’t like and WHY they didn’t work for us; and spent a little time making notes about what we like or what parts have worked. We now have a place to start when it comes time to brainstorm ideas. Which is what we’re going to be doing in Part 2. I can’t wait! Until then, work on those notes. Don’t stress about it, just take a few minutes to jot things down when you can. I’d love to hear from you. What hasn’t worked for you in the past? What has worked? Previous Post: « Boy, What a Busy, Fun-Filled Day! This blog post is wonderful and very timely. I wanted a Filofax but Amazon disappointed me. So I have an old day timer and that will work. Robin, I used everclip to clip my recipes and put them into Evernote which is also tied to the Say Mmm program. In combination they are amazing. As for health, I have MS and so I know about memory issues. I have a small calendar that I keep in my purse as well as the planner. I found a free app called Carezone to manage my symptoms and appointments and medications. Extremely helpful! All the best with your planning and health. Wow Karen, it sounds like you have a solid start to a system that is working for you. I love that you’ve been able to combine paper and digital to make sure you’re filling all your needs. I hope some of my tips help along the way. I’m sorry to hear about your health. You’re in my thoughts and prayers! I hope 2015 is an amazing year for you. My “planner” is a 3-ring binder with printed calendar pages. However, I’m trying to find a smaller personal size one that I can buy zip pockets and card pages to use as an actual wallet. I can never find a wallet that has enough card slots for credit cards, insurance cards, etc. I know its out there but I just have to find it and I don’t want to spend a ton of money. That is a brilliant idea! I never would have thought of turning a small binder into a wallet planner combo. Have you tried Staples? (if you have one in your area) I know the Martha Stewart section has a nice variety of inserts and pockets for the mini binder size. If you can’t find any in that section, try the binder section. I know that Staples usually carries mini binders in their own brand name and Avery ones. If you still can’t find them in that section, you could check the planner section. They might have something there would work for. It might cost a little more but they might also be a little more durable. I have heard rumors that Target in the US is carrying mini binders now too, but I’m not sure if they have any accessories for them. The perfect planner depends a lot on the “where,” too, as in where you plan. I am often out of the house, so mine needs to be portable. But I am definitely a paper planner person. That is an excellent point. If you’re not sitting at home when you’re planning then having a portable one is going serve you so much better. And vice verses, if you only ever use your planner at home, having a portable might not be a necessity. You’re in luck, I take requests for printables. If you want to send me an email giving me some info about what it is you are looking for, I’ll see what I can do. I make no promises, but I will try my best. Consider watching planner videos on you tube and making a list of what would work for you BEFORE wasting money on a planner. That way, you get one that you will use instead of wasting money! That is a great idea Kristy. Gathering ideas is a great way to start. I could easily spend all day watching planner videos. Thanks so much for sharing that tip. The blue book in the photo is an Arc Jr Notebook from Staples. They are my favourite books to use for planners. They have all the versatility of a binder and all the flexibility of a coil bound notebook. If you decide to pick one up you’ll also need to purchase the hole punch for it so you can use the system with any planner printable you like. I love this post. I come back to it often when I have a life change, which seems to happen a lot. Thank you for your amazing thoughts on keeping life straight! Bring on another year!! Oh Marie, I’m so happy to hear that! Life seems to change a lot on us too, especially lately. It can make keeping up and staying organized really difficult can’t it? I just found your website and printables…THANK YOU! I have searched all over for planners that fit what I want. I recently bought a TUL mini and decided to create my own. Then I stumbled across your printable templates. Wish me luck! I’m so happy you found us. I hope you were able to find a few printables that will fit your needs. I wish you all the best in building a planner that is just right for you. Part of your webpages on the left do not show on tablets or mobile browsers. Just wanted to let you know. Hi Sue, thank you so much for letting me know. I try to make sure I visit the site on mobile devices often but last week was a little on the hectic side. I really do appreciate you letting me know. It’s been fixed now, so it should work all right for you.